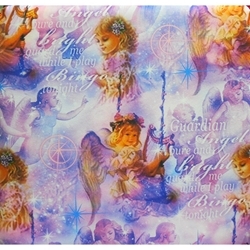 Bring your Guardian Angel to your Bingo Hall with this 10-pocket dauber bag. Ten dauber sized pockets wrap around the outer edge of this bag. Two beaded drawstrings help to open and close the bag. Images of various angels amongst the stars and clouds decorate this pattern. The poem amongst the angels says, "Guardian angel pure and bright, guard me while I play Bingo tonight". This dauber bag comes with a complementary matching pouch. Daubers purchased seperately. Brand new for you!